Actually, that's not quite true. Excited? Heck, I'm thrilled beyond words. I saw it first at Borderlands Books in San Francisco on 28 October, when I took part in a mass signing at the store prior to the World Fantasy Convention in San Jose that weekend (many than ks to Alan Beatts and Jude Feldman for their kind invite). I walked in the door of Borderlands and there it was: my book, on a table with other books. Real books, by real writers. I picked up a copy and grinned, and Christopher snapped this picture, of me holding my collection for the first time. That's me in the red jacket, with Jude Feldman. Up to that point I'd seen an ARC of the book, but this was the first time I'd seen and held a copy of the collection, and it was a wonderful moment. Perhaps there are authors for whom the release of a book elicits little more than 'Ho hum, a book, how nice,' but I'm not amongst their number, and hope never to be. Northwest Passages was available in the Dealers' Room at World Fantasy, and is now available through varied sources, including the Prime Books website (which also offers the deluxe, leatherbound edition, which comes with a chapbook featuring my first ghost story, 'Dead Man's Pears'), Amazon and its affiliates in Canada and the U.K., Barnes & Noble, and Chapters/Indigo. 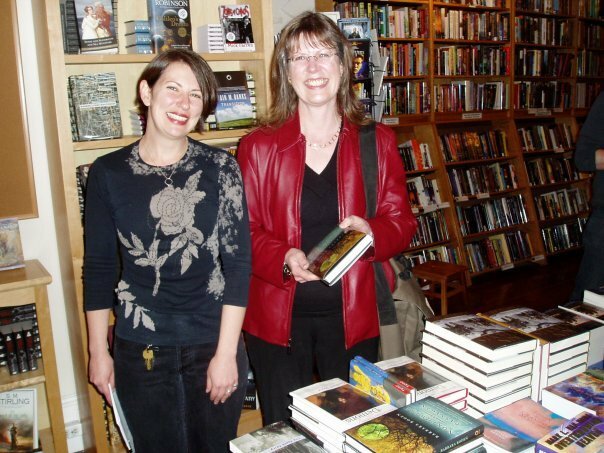 I'm hoping to have a signing at the Chapters branch in Kamloops sometime in the New Year. I should also mention that anyone who'd like a signed and/or inscribed copy can obtain one through me, as I have stocks available; feel free to contact me for details. World Fantasy in San Jose was tremendous fun; it was wonderful to spend time with good friends, and to know that I'll see many of them again at the World Horror Convention in Brighton in March 2010. Ash-Tree Press will have six - count 'em, six - books debuting between now and then, by authors who will be at the convention: Larry Connolly, Steve Duffy, Paul Finch, Gary McMahon, Lisa Tuttle, and Simon Kurt Unsworth. We're planning a special launch/signing affair in Brighton, and look forward to a grand event. If you're going to be at WHC, set aside Friday 29 March from 2.00 to 3.00 pm! I'm reminded that tomorrow - 23 November - marks the 46th anniversary of the broadcast of the first episode of Doctor Who ('An Unearthly Child'). I've come fairly recently to DW, thanks to Tim's devotion to the show, but even so, the sound of THAT theme song - in any of its iterations - makes me smile. Here's the opening ten minutes of that first show; hang in until 1.40 to catch a first glimpse of the TARDIS. All credit to composer Ron Grainer, and to Delia Derbyshire, who was responsible for the electronic realisation of Grainer's theme. I've already blogged about my love of the Basil Rathbone/Nigel Bruce Sherlock Holmes films (fourteen in all, made bet ween 1939 and 1946). I've seen them so many times that I know great chunks of the dialogue by heart, and as soon as the remastered films were made available on DVD I bought the set; but that doesn't diminish my pleasure at hearing the news that Turner Classic Movies will, on 25 and 26 December, be broadcasting eighteen Sherlock Holmes films back to back, including thirteen of the fourteen Rathbone/Bruce films. 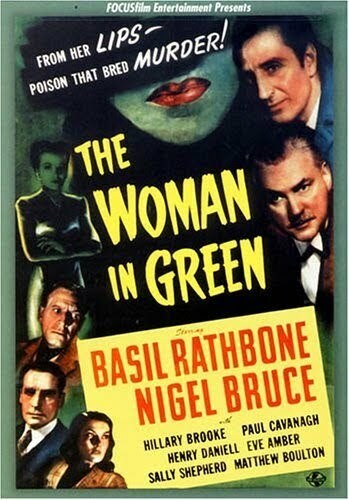 The missing one is The Woman in Green, and that's understandable, as it's one of the weaker films in the series. However, Pursuit to Algiers is widely held to be the nadir of the Universal series - a view with which I concur - and Woman in Green does boast the undoubted pleasure of Henry Daniell's Professor Moriarty. In his autobiography, Rathbone said that Daniell was the best of the three actors (George Zucco and Lionel Atwill being the other two) who played Moriarty to his Holmes, and if you watch this encounter between the two actors you'll find it hard to disagree. Not canonical, perhaps, but when the result is this fine it's hard to quibble. From where I sit typing these words, I can glance to my right and see, in the hallway, a framed original poster from this film, which I bought largely because it featured Daniell (second from the bottom on the left). I think it's safe to say that, come Boxing Day, TCM will be playing softly in the background, as the game is afoot once more. Last but not least, I'm going to try to update this blog each week, every Sunday evening PST, writing about whatever strikes my fancy. Feel free to comment! And Steve - it's now Monday morning. Time for WURK. . . . The book is WONDERFUL. I can't say it as well as Dr. D did, but I'm totally impressed (though not surprised) & so very, VERY proud of you. I'll have to call sometime & be fannish, iffen you don't mind.